The judgment on 23rd November, 7th day of the trial, sentenced Mair to life-imprisonment. This trial would have made judges of old turn in their graves. What, no defence? Not a word from the accused, not even as to whether he was guilty or not? No sign of any dead body? Was it hacked to death and no drop of blood to be seen? I heard the jury being told that they could not be shown photos of the actual corpse, because it might upset them, and instead would only be shown computer-generated images. ‘Habeus corpus,’ a most basic concept of British justice, translates as, ‘have you got the body?’ That is necessary for a murder trial to proceed. In this case we have seen no pictures of Jo cox’s dead body, nor any credible-looking death certificate from a coroner or receipt from Leeds General Infirmary of receipt of the body, somewhere around 1.40 on 16.6.16. There is no body, there is no blood. Trial and verdict via media had totally prejudged the case before the court even opened. Who was the man sitting in the Old Bailey court 8 for six days, looking utterly bored and uninterested? Even when CCTV was shown of allegedly him hacking someone to death, I saw him not bother to look up. Nobody asked a witness to identify him, no-one asked him to swear on oath as to who he was. They could have easily given us evidence that his DNA matched that found in Thomas Mair’s home, had they wished: but did not. Was he some police agent? Maybe he was silent because, although a lookalike, his voice would not have sounded like Mair. Here is the one and only picture the world was shown on T.M. 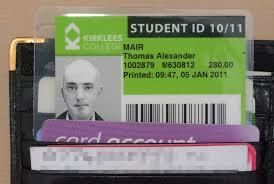 after the event, compared with (a) an earlier student I.D. of his, (b) the picture of the man on trial, (c) a CCTV image shown at the trial, supposedly taken just before the murder. If I may quote the view of H.T. (who collected these 4 images): “To me that [the student I.D.] does look like the gardener’s face, but not so much like the interviewed person, nor the police pic, nor the CCTV attacker. Can we demand CCTV moving footage somehow, that the still was taken from?” She noted that the ‘CCTV attacker’ had a longer face, a knobbly nose, a beard and maybe dark moustache I was told that the Defence was not contesting his identity and therefore the Court did not require evidence of who he was. The Defence contested virtually nothing in this trial – in fact there was no defence. Hi-res images were soon posted up, showing the pavement all around the library and not a drop of blood anywhere. The story needed blood and so when ‘Thomas Mair’ was arrested – making no attempt to escape or resist – they dashed his head against the pavement so he was bleeding profusely. Soon they were claiming that his blood DNA-tested was inside his zip-up carrier bag, and over his mobile phone, on his gun, etc. This was very thorough, but the story didn’t make sense – how was it supposed to have got inside his bag and onto these various objects? The story didn’t need to make sense – the media give their fatuous, daily accounts of the trial, ensuring that citizens received their dose of horror, and heard how wicked was this ‘Britain first’ loner. No-one can afford to buy a transcript of the court proceedings, so as long as the jury vote him guilty, which they did of course, then we will soon forget about it, don’t we? Instead, her car the silver Astra Vauxhall had just parked by the library, and she emerged with two others, when she was set upon, at 12.52. Then death was certified at 1.48 pm. 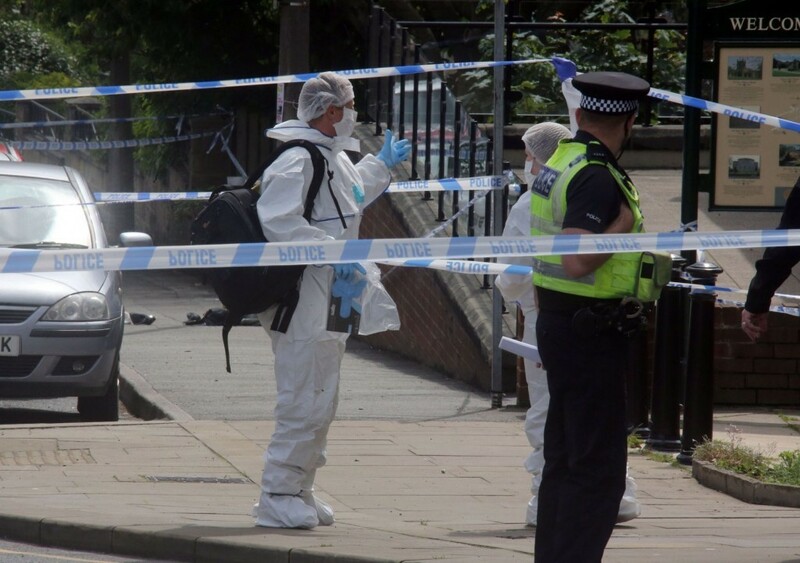 As Jo Cox was lying on the pavement, then – if you believe Richard Whittam lawyer for the prosecution – she dragged herself along and rolled into the road between two cars, in her death agony. On the next day the 17th two local newspapers reported their stories: that she had been pronounced dead on the ground i.e. pavement in front of the library (Yorkshire Evening Post); or, pronounced dead in the Leeds Infirmary at that same time (Huddersfield Examiner). It’s unclear what happened to her, but no-one photographed a stretcher with the body of the local MP being carried into an ambulance. Such a photographic image could not possibly have been missed. Despite all the people standing around, no-one photographed anything at all! We note the pair of shoes in the distance: she crawled in her death-agony along that stretch of pavement – or so the Court was told. The Court heard several different stories of where she was attacked. The day after the event, the Yorkshire Evening Post reported that she had been walking down that slope coming out of the library, when she was attacked. That was also the BBC news version, just hours after the event: ‘She only managed to walk a few yards from the library where (1 min) she was holding surgery meeting, speaking to her constituents before she was shot…. Minutes before the attack she was in her local library.’ Also on the day the Mirror reported only that she had been ‘critically injured.’ How could these first accounts be so wrong? The Surgery at the library was to have been 1-2 pm, and Ms Cox was just emerging from her car when it happened, that soon became the standard account. The first witness told how the silver Vauxhall Astra car drove up to the library and three people got out: Jo Cox, Fuzilla Aswat her personal assistant (who drove the car) and Sandra Major. Ms Cox went around the back of the car when someone was ‘caught on CCTV’ rushing towards her. Later on the death-scene shifted to the front of that car, with accounts of how she fell onto the pavement then rolled over into the road, between two cars. 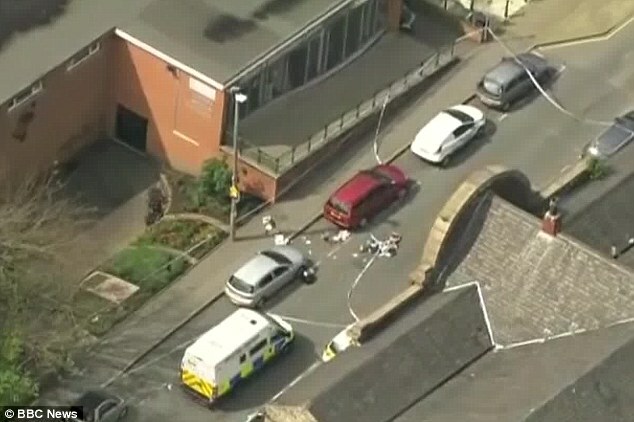 Here is the BBC picture of what the scene was supposed to look like from the air, you can see the space in-between the two cars with some ‘décor,’ but no sign of any death-struggle anywhere. Can a person be stabbed fifteen times and shot three times, and then lie there for quite a while, with no drop of blood anywhere? Accounts kept varying as to whether Ms Cox dies on the pavement or in Leeds General Infirmary. She was shot in the head at point-blank range with a rifle-gun and so fell backwards onto the ground (court testimony by Sandra Major) and then she started to speak! ‘Get away, get away you two! Let him hurt me – don’t let him hurt you.’ Yes it’s an absurd narrative – and would we expect it from one shot in the face at point-blank range? Are not some rather poor storytellers at work here? If it’s not physically possible, it didn’t happen. 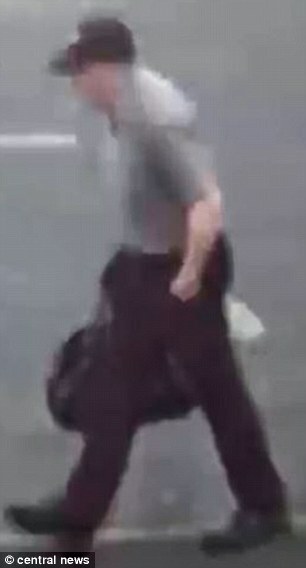 ‘Mair’ in his late fifties was described by Ms Aswat as wearing a dark baseball hat, having silvery hair over his eyes and ears and having a blue holdall bag. Throughout this case, accounts of whether ‘Mair’ was wearing a black or white cap would keep changing, in an absurd manner. At a quarter to ten on that morning the 16th, his neighbor Julia Nelson who knew him well was on the 229 bus, when she saw him walking along, with his little goatee beard, grey in color. He always wore a baseball cap, she said, the usual light-color. That sounded quite authentic. He had a beard, and so the fellow in the court had to have a beard – contrary to the picture we’d all been given of him earlier, clean-shaven. 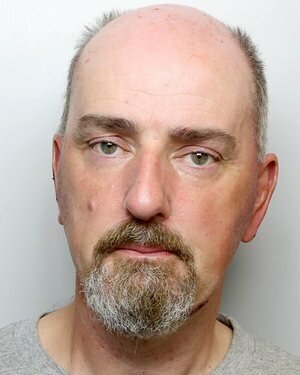 The Court heard in great detail from a forensic DNA expert on where it was found, identifying it as that of Thomas Mair, but not saying who the Thomas Mair was from whom they had taken their source-sample for comparison. They could have easily taken some from his flat, and ascertained whether it was the same as that of the guy in the dock. The police arrested their suspect and at once caused him to bleed profusely – was that the source of the DNA matching? The whole event is very much like a conjuring-trick, where you think you have seen a tragic death, but the whole core of the story is simply missing. The narrative keeps, changing, which sort of hints that the thing did not happen. The picture that emerged of the man known as Tom or Tommy from those who knew him best was of a quiet and caring loner. His half-brother, who is mixed race, claimed he had been volunteering at a school for children with disabilities for several years and had never expressed any racist views. Duane St Louis, 41, described his brother as a devoted son who shopped for their mother twice a week and who had visited her on Wednesday night to help tune her TV. He would give locals gardening tips as he strolled down the road to use the library computer. Duane insisted his brother had never expressed any racist views and seemed quite happy to have a mixed-race sibling. Asked whether his brother had any strong political views, he replied: “Not that I know of.” He said he had no idea how Mair had got hold of a gun and did not have any hobbies that would require a firearms licence. Duane said he couldn’t believe the news. “I was watching Sky News and I recognised him in handcuffs on the ground,” he said. “It felt like a dream. I just couldn’t believe he’d do something like that. Friends said Mair had never shown any interest in politics or the EU referendum. I can honestly say it has done me more good than all the psychotherapy and medication in the world. Many people who suffer from mental illness are socially isolated and disconnected from society, feelings of worthlessness are also common, mainly caused by long-term unemployment. All these problems are alleviated by doing voluntary work. Getting out of the house and meeting new people is a good thing, but more important in my view is doing physically demanding and useful labour. When you have finished there is a feeling of achievement which is emotionally rewarding and psychologically fulfilling. For people for whom full-time, paid employment is not possible for a variety of reasons, voluntary work offers a socially positive and therapeutic alternative. At half-past one on the day, 16.6.16, the police burgled his flat and emerged with the claim that they had found Nazi regalia and shelfloads of far-right literature. That, I suggest, is not credible. We only heard of the claim in the old Bailey trial, i.e. they had months to prepare it. 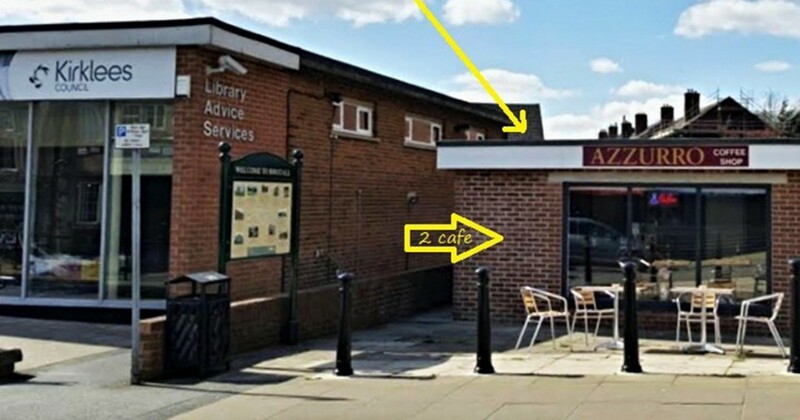 The police ‘seized the computers’ at the local Birstall library, where Mair had been the previous evening to visit far-right websites – mentioning the Daily Stormer. No local library would permit visiting such an ‘far-right’ website. Try asking your local library. This could be a new reason to avoid living alone, that police are liable to raid one’s flat and ‘find’ what? ‘Stuffed inside a draw was a copy of the book “Blood in the Face: The Ku Klux Klan, Aryan Nations, Nazi Skinheads, and the Rise of a New White Culture” and a Nazi Waffen SS book on race theory and mate selection guidelines,’ etc., etc. Sure. The Jury were misled, believing that both sides of a case were going to be put to them, as was traditionally the case. I heard them being literally threatened with imprisonment if they should visit websites (i.e. try to find out what happened) during this trial. Trapped into silence, they really only had one option. ‘The rest is silence’ – a haunting awful silence, after justice has not been done. We remember the Memorial Service to Jo Cox the very next day, where no trace of grief could be seen on the faces of her family. Her sister who had just ‘identified the body’ could hardly keep a straight face. Should that have been relevant to this trial? Jo Cox “was reported by Haaretz in Jerusalem as being a campaign manager for Obama in 2008”, was that relevant? It’s hard to find a wedding certificate for her and Brendon Cox, as if she had changed her name from Leadbeater to Cox without a legal wedding. 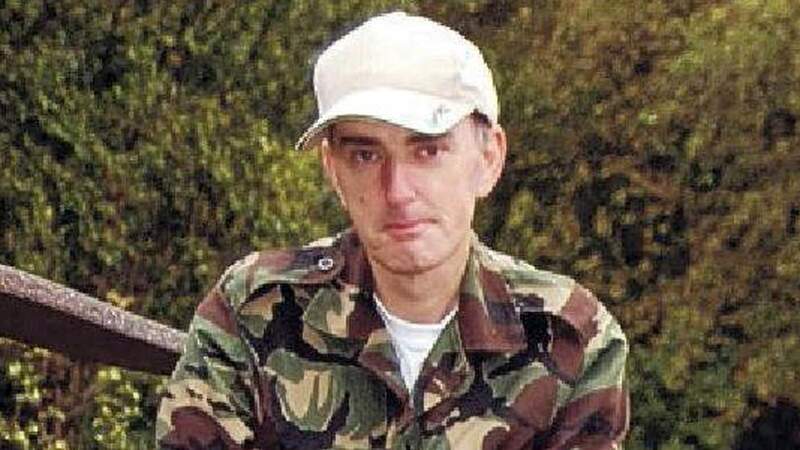 The identity of Bernard Kelly is rather suspect and unclear, ostensibly having the same birthday as Jo Cox on 22nd , the day before the Brexit vote, and being 77 years old: it seemed as if there were two of him ,or if he had maybe died in 2013; having a deadly dagger shoved into his chest to seventeen centimetres (as the prosecution lawyer reaffirmed) and then seeming OK a few weeks later – if he could just have turned up in court it would have done a lot to resolve these questions. But, maybe that is why he couldn’t. His testimony was just read out – hearsay evidence, why was that allowed? One of the four charges against Mair was that he had caused GBH to Mr Bernard Kelly, so how could the jury endorse that charge with him not even turning up?